Janet Napolitano, the secretary of Homeland Security, will step down from her post to lead the University of California system. Napolitano, who has served as President Barack Obama's homeland security secretary since the beginning of his first term, is expected to leave the agency in about six weeks, when the school’s fall semester begins. “After four plus years of focusing on these challenges, I will be nominated as the next president of the University of California to play a role in educating our nation’s next generation of leaders,” she said. U.S. Homeland Security Secretary Janet Napolitano speaks to Reuters in Washington in this March 30, 2011 file photo. "I want to thank Secretary Napolitano for her outstanding work on behalf of the American people over the last four years," President Barack Obama said in a statement. "At the Department of Homeland Security, Janet’s portfolio has included some of the toughest challenges facing our country." "Since day one, Janet has led my administration’s effort to secure our borders, deploying a historic number of resources, while also taking steps to make our immigration system fairer and more consistent with our values," Obama said. The Los Angeles Times first reported the appointment, which comes after what the paper describes as a “secretive process” to make the unusual appointment of a high-profile political figure to lead the huge university system. Napolitano has at times been a polarizing figure during her time in charge of the agency tasked with preventing terrorist attacks, responding to natural disasters and maintaining border security. Republicans have said the department, under her leadership, has failed to adequately measure what it calls an unprecedented build-up of security resources at the U.S.-Mexico border. White House Press Secretary Jay Carney says the White House 'greatly appreciates' Janet Napolitano for her services as the head of Homeland Security. 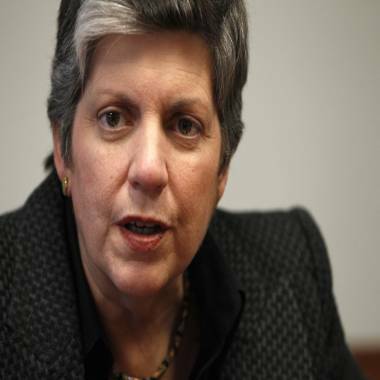 Napolitano recently announced she will resign from her post to head the University of California system. Republicans additionally scrutinized Napolitano for her knowledge of the "Fast and Furious" gun-running operation, which resulted in an ATF agent's murder. Critics also said that flaws in DHS communications may have allowed the Boston Marathon suspects to slip through the cracks. The next secretary of Homeland Security could be tasked with overseeing border security measures and certifying the use of E-Verify, the employee identification program used to verify a worker's immigration status. But the fate of such legislation to overhaul the nation’s immigration system is now unclear, with the GOP-led House declining to take up the Senate bill, which would have boosted border security and offered an estimated 11 million undocumented immigrants a pathway to citizenship. Napolitano, a former governor of Arizona, will take over a system with a yearly budget of $24 billion and over 200,000 students. She attended Santa Clara University and was the school’s first female valedictorian.